The peace deal signed today in Addis Ababa between the government of South Sudan and armed opposition groups has significant flaws, including failing to address the looting by leaders of state resources and revenues. These shortcomings could easily lead the country right back to full-scale war. John Prendergast, Founding Director of the Enough Project and Co-Founder of The Sentry, said: "Today's peace deal lacks meaningful checks and balances on a presidency that already wields immense powers, which are primarily used to loot the country's resources and deploy extreme violence against opponents. South Sudan's vast oil revenues have been pocketed by high-level politicians and their families and carted out of the country. This new peace deal fails to undo the theft of government revenue by entrusting the same corrupt politicians without any meaningful checks and balances." Brian Adeba, Deputy Director of Policy at the Enough Project, said: "This peace deal is simply a division of the spoils between the rival factions with the biggest guns. The signed agreement reinforces the status quo and increases the odds of a full-fledged return to war, in its failure to address state capture by these politicians or reform in hijacked institutions. 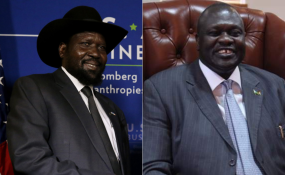 The U.S. and other willing nations should impose sanctions and anti-money laundering measures on the networks of South Sudanese officials and their commercial collaborators who continue to loot the country's resources and to deny them access to the international banking system." This Monday, September 10, 2018, John Prendergast, Founding Director of the Enough Project and Co-Founder of The Sentry, briefed the United Nations Security Council in a first-ever session on corruption and conflict, highlighting the fundamental need to address violent kleptocracy in peace efforts.